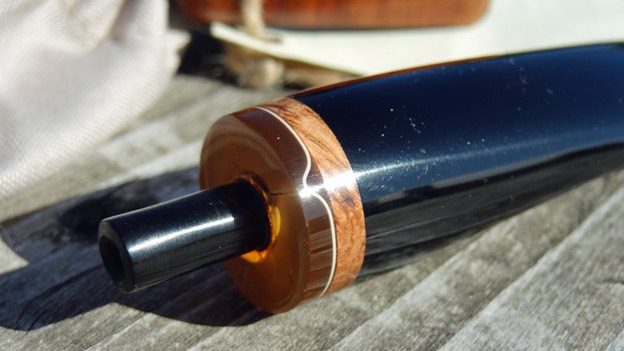 It seems there is always one ‘thing’ about a pipecrafter’s style that draws my attention. There is always one sort of standout characteristic that tells me, “You need to get to know this guy!” Things like Bruce Weaver’s blasting techniques, the finishes of Dotter pipes, the classic ‘tough guy’ poker shapes from Mark Balkovec (who can do much more than a classic poker I assure you …), etc. You get the picture. In sports we call this the “intangible”. For 40-year old Patrick Slazansky, his intangible is the ability to show a new, modernized, yet eclectic take on traditional shapes and styles that draws me. He gives an updated personal look at rustications and finishes, shapes and styles that we have all seen dozens of times before. In the process, he just makes them seem, well—just better. Anytime an original ‘classic’ is remade, it has to at least take on a uniqueness to itself, or it is just another stale cover of a classic. Consider remakes of older classic movies like True Grit, or Ocean’s Eleven. New looks at old classics. Not done to mimic the classic original, but to bring it new and unique life. Slazansky’s work in this arena is nothing short of brilliant, and that’s what brings us to look more closely at his work. I’ll give you a pipe example. Panel pipes, for whatever reason, never did anything for me. They just looked like a pipe made by a man that did not know how to make a round one. A square pipe? Even worse. Alas, and to be fair, square and paneled pipes do have their following. Suffice it to say that Patrick has piqued my interest now, as he makes right angles look better on pipes than anyone in the business. 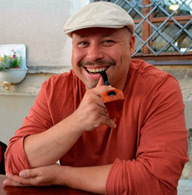 Patrick Slazansky is a native of Slovakia. By his own admission he is fascinated by the beauty and elegance of a pipe. As a student of engineering, photography, graphic arts and design, his eyes are keenly attuned to the finer points of what makes something ‘elegant’. Having started carving about two years ago, Patrick still considers himself a novice. However, the natural ‘pipe’ talents within Patrick, influenced and accentuated by his aforementioned knowledge-base, provided the perfect recipe for a pipe carver, and the finished products I’ve seen reflect a level of experience far beyond the two years he has been actively carving. The pipe that Patrick sent for review is a stunning beauty. A Freehand extra-large plateau model he has lovingly named “April”. All his pipes are named, a trait that I feel will be warmly welcomed by pipe smokers, enthusiasts, and collectors all over the world (since most of us give them ‘names’ or identifying monikers along the way anyhow …). This handful of a custom pipe had me smiling before it ever was completely unwrapped and out of the sock. Patrick gave me ample notice that the pipe was on the way. Like every doting father, he emailed me regularly to see if his ‘April’ had arrived safely. Like any spring flower that graces the plains and prairies, or the mountain meadows when the snow finally melts after a harsh winter, it is with great expectation that the time finally arrives when we get to see these things come to bloom. Unpacking this pipe was like a flower opening before my eyes. Each step taken, each piece of packing material peeled back revealed more. It was like opening a spring Christmas present, or eating one of those blooming onions, where each layer revealed another tasty surprise. April (the pipe remember), was packed with his stylized business card, a Certificate of manufacture, an informational pamphlet about P.S. 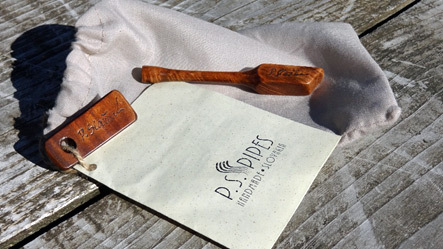 Pipes, a custom made tamper, and the pipe itself in a sock who’s drawstring is capped with a detailed wooden nameplate. All in all, this is the most complete and professional packing I have seen to date. I’ve seem massive pipes before. While this is what I’d call extra-large, it is not massive in either physical size or weight. Massive in my mind demands a full purchase on the pipe at all times, and is certainly uncomfortable to hold in the mouth unsupported. This pipe, despite its extra-large size, is in fact comfortable in the mouth without support and weighs a slight 72 grams. Aesthetically, April is beautiful. Portly, yes, but some people like a little more meat on the bones so to speak. Her complexion was as smooth as glass, and she was finely accessorized. I was immediately taken by her stems accent ring, drawing my attention to a tinted yet see-through acrylic cap of a brilliant honey amber shade. The stem was impressively smooth and tapered well to a nice oval bit that would be welcomed by the lips of any smoker. The sock is a loosely woven material of beige color that seems to be a combination acrylic/cotton material with a drawstring made of raw woven hemp. Going old school on the draw string really adds to the appeal of the package—especially when weighed in conjunction with the tamper, wooden badge and natural course ground/parchment looking paper used for the printing of the informational pamphlet. I’m not certain that the intent was to go “green” with the materials, but the package blended perfectly together to create the allusion of a well-determined design look and function. 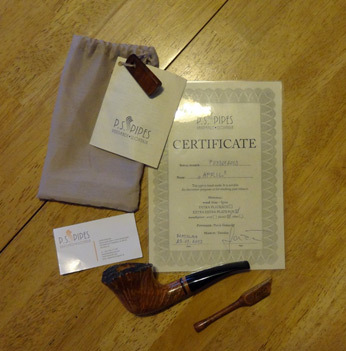 Patrick purchases his briar from Spain through Jaume Hom. With only one small flaw in her surface, April flows every direction with a constant and reliable curvature, always moving, flowing, undulating, until she capitulates to the stem and plateau. The heel shows just the slightest beginnings of some birds-eye grain, which transitions into a nice flame-grain that flickers and flares at the mouth, but otherwise pulls the eyes onward to the balance of the pipe like the bells of an ice cream truck drawing you ever closer to your tasty treat. As far as engineering goes, the draft hole vents dead center just a hair above the base of the 5/8″ bowl, and couldn’t be cut much better. The bowl’s surface itself is not the smoothest I have felt, but the more I work with and smoke briar pipes the less concerned I am with this, and the more I think it is actually better for breaking in a raw bowl pipe. The mass of the stummel itself will not allow any reasonable smoker to ever experience heat through the walls of the bowl, and will make for a very comfortable smoker. The coolest thing about a plateau freehand is the plateau surface itself. On April, it appears on the top of the bowl rim. Dimpled and dotted with varying sizes of briar peaks, in between lie soft supple rows of small valleys creating the look of a wind-blown moonscape, or the South Col ridge of Everest. I love this about plateau pipes and always take some joy in contemplating that surface. Each surface unique by nature, a divinely established pattern, April’s plateau draws the mind like a contrary philosopher trying to right a rhetorical wrong, or figure out if it is even worth the time to do so. 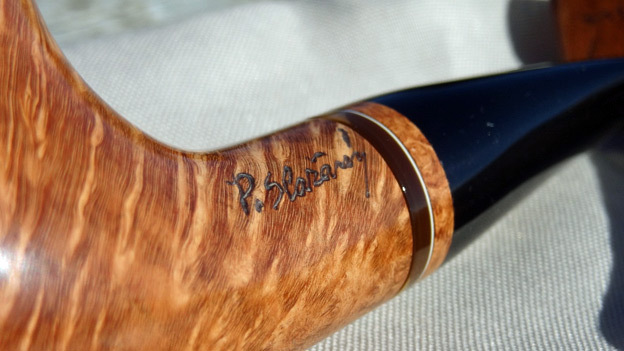 Simply put, this thick rimmed stummel with its plateau surface is one of the main attractions to this pipe. One might rightfully point out that this feature and its aesthetic beauty were not something created directly by the carver himself. The counter to that is that it was the wisdom and artistic eye of Patrick that saw the need to retain this feature in order to make it such a prominent focal point in the finished product. This was a choice indicating the rapid maturity of a carver who has only been at it for a couple of years. The shank of the pipe is robust, but for such a pipe this is necessary. A boiling grain on the underside near the heel, gives way quickly to that aforementioned flame grain that proceeds to wrap itself around to the top. The shank features the location of Patrick’s stamping as well. The stamp is simply Patrick’s last name, but “Slazansky” is stylized and flared giving an artistic impression that bodes well with the overall design. With the beautifully grained and finished shank reaching out to shake hands with the stem, the greeting is clearly a friendly jesture. The stem is hand-turned and hand-finished of ebonite. 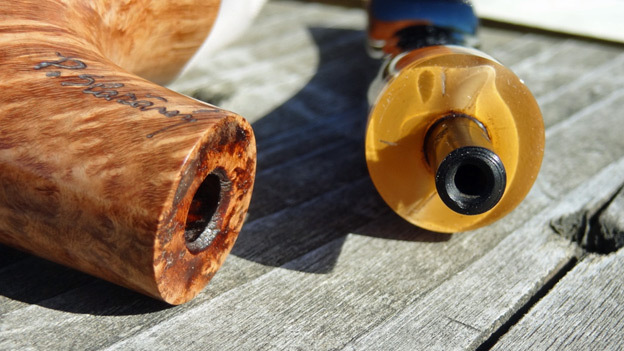 Patrick has added two accent rings one of briar, and the cap of translucent amber acrylic. Just as the plateau rim of April is ‘natures’ focal point, Patrick through his skilled hands has made this stem’s accent ring the ‘man-made’ focal point. This amber accent ring, allowing light to pass through it brings a brilliance to the center of the pipe. Not only that, but intelligence goes beyond just the idea of it presenting natural light as if by fiber-optics. This amber ring is topped with a thin ribbon of white, dips towards the shank leaving a peak of white twice in the ring itself. This thin white line has become something of a trademark for Patrick. I’ve seen it on most if not all of his pipes on his web site, and it is an attractive feature on all of them. What good is a fabulously looking pipe if it doesn’t smoke well? For a collector who sees pipes as art (as they most certainly are), it doesn’t matter as much. But by a large margin, most pipe buyers are smokers who purchase their pipes for just such a purpose, smoking – and cannot afford to spend good money on artisan pipes that do not smoke well. While the works of P.S. Pipes have yet to develop a world market reputation, this is a great opportunity to get a qualify artisan smoking pipe for well under $200 USD/€130 Euros. This is the test were form meets function. April has an ample bowl, and can serve well for the long sit by the fire with a good book and glass of tea. It seemed almost a waste to fill the bowl for just a short, quick smoke. Not to mention that this may not provide a representative sampling of how the pipe performs. With this in mind, I filled the pipe with a Tinder Box blend call Norse Gold, packed a near full bowl of this, one of my favorite aromatics, and headed out back for the porch swing. Thick rimmed pipes take a little more care in getting lit if you are using a pipe safe lighter. 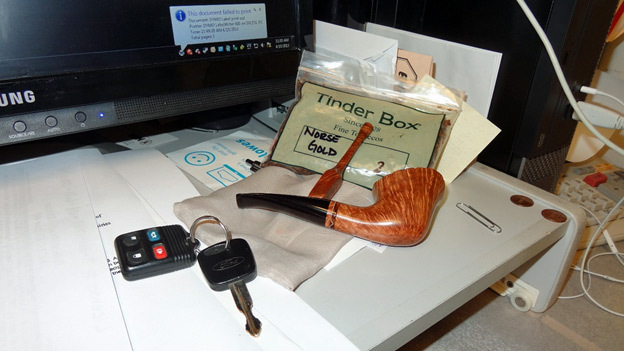 I prefer a match light, and so striking the gray-tipped red-headed match, I put it to the Tinder Box Norse Gold and with a few quick draws was puffing the heavy smoke I look for to know the bowl is well lit. In spite of the shank being over ¾” at the heel, and tapering slowly to give the look of a thick, bulky fixture, the stem narrows quickly at the half-way point, morphing into a soft and welcoming bit. Smooth as silk; one could not detect the slightest hint of a sharp edge or any roughness on either the inside or outside of the rim. Because of the stem’s slight downward bend, the pipe rides comfortably just below the jaw-line, and also rests nicely on my chin when not being held. The blossoming flair at the rim provides an excellent ’shelf’ for the thumb and forefinger, making a soft safe purchase of the pipe easily and comfortably achieved. This pipe feels like it was made with this thought in mind – almost as if it were my hand that was measured when the shape itself was being finalized. Just a stroke of good luck I guess. Passing one of my personal tests, the bowl smoked smoothly, coolly, – and left me wanting to refill the bowl and go at it again. I have owned hundreds of pipes, from mass produced factory pipes, to high quality brands like Stanwell and Dunhill. I have also owned my fair share of custom artisan pipes. April, from P.S. Pipes has no reason to feel as though it does not belong in the ranks of artisan pipes, on the same racks as many others. Knowing that his work is currently selling in the range of €65/$85 and up, P.S. Pipes are an excellent investment, that I can see gaining in value and making a nice investment for the collector or smoker. Simply put; I’m a believer. I’m going to have to order one of those square pokers! Rusticated no less.